With an increase in the number of people deciding to purchase conservatories in 2018 it is important to find the right company to use for your new conservatory and one that you trust to get the job done on time and one that focuses on the quality of the conservatory roof. Failure to have a tiled conservatory roof can cause a variety of problems for you and your home and in some cases means that your conservatories are unusable during summer and the winter months! This is due to the poor insulation and heat retention properties with traditional materials used for roofs. Here at Guardian Roofs we are specialists at installing the Guardian Warm Roof and we have been working in the conservatory roofing industry for the past 10 years and in that time constantly review the service we offer and listen to what our customers say to ensure that our customers are constantly satisfied with the conservatory roofs that we offer and supply. 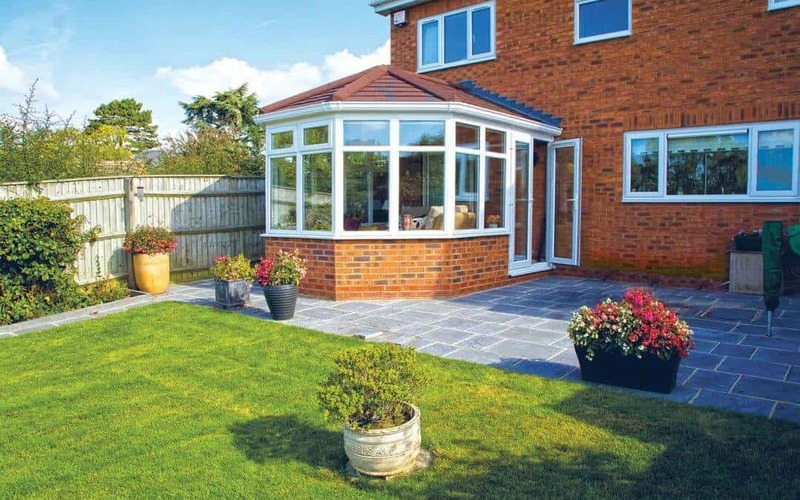 If you have any questions about you should use Guardian Roofs as your Tiled Conservatory Roof Company then please get in touch with a member of our team today and we will be happy to help answer any questions that you may have. What is the Tiled Guardian Warm Roof Conservatory we offer? Here at Guardian Roofs UK we are proud to offer the Guardian Warm Roof to all of our customers across the entirety of the UK and still ensure a local service through our team Guardian Members. The Guardian Warm Roof is essentially a solid lightweight tiled alternative to the traditional Glass and Polycarbonate roofs. The roof directly corrects the problems experienced with traditional roofs and allows you to use your conservatory throughout the year no matter what weather. The Roof itself is able to produce a U Value of 0.18 which is a lot lower than traditional conservatory roofs and means that during the winter months your heating bills will be a lot lower than usual. The Guardian Warm Roof comes in a variety of styles to suit your taste and preference and allows you to fully customise your conservatory. In addition to the style of the conservatory, you can also change the finish of your conservatory which relates to the material used on top of the conservatory, we have a variety of our own slate products and also can use the Metrotile on the roof to allow your new conservatory roof to fit in seamlessly with the rest of your homes aesthetic appearance. Check out some of the most recent tiled conservatory roofs we have installed by heading to our Conservatory Gallery page. Why should you replace your conservatory roof? Replacing your conservatory is a good idea for a variety of reasons, first and foremost replacing your current conservatory roof with a Guardian Warm Roof allows you to use the conservatory throughout the year no matter what the weather. This is due to the heat retention and insulation properties of the Guardian Warm Roof allowing you to pay less for your energy bills in the winter months and the conservatory will not get too warm during the summer months. Replacing a conservatory roof also impacts the resale value of your property as a property with a newly fitted Guardian Warm Roof will set itself apart in a crowded market. Another great thing about the Guardian Warm Roof is that the Metrotile has a 40-year Weatherproof warranty on the roof so any problems that may arise can easily be solved and fixed. Where is your nearest Conservatory Roof Company? We have team Guardian members across the whole of the UK and ensure national coverage with a local service. You can find your nearest Guardian Warm Roof Approved installer by heading over to the link provided. The good thing about having an installer local to you is that if there are ever any problems with your Tiled Conservatory then we can be on hand promptly to sort and fix the problem. Who are Guardian Roofs UK? Guardian Roofs UK has over 10 years of experience in the Guardian Roofing industry and in that time we have been dedicated to ensuring that standards are constantly raised within the conservatory roofing industry and that customers are always pleased with our Tiled Conservatory Roofs. Something we are extremely proud of is our installation time. We install conservatory roofs in as little as 3 days and if we start a job on a Monday we guarantee to be finished by the Friday we are able to do this because the Guardian Warm Roofs are prefabricated and manufactured in a warehouse away from the installation site which speeds up our job massively. If you have any questions about why we should be your Tiled Conservatory Roof Company then please get in touch with a member of the Guardian Roofs team today!